The world is currently in the midst of the greatest refugee challenge in modern history. According to the U.N. High Commissioner for Refugees, or UNHCR, more than 65 million people were displaced across the globe as of the end of 2015—up from 59.5 million people a year earlier. Of those, more than 21 million are refugees, outside their home countries and in need of protection. The most public face of the crisis has been the civil war in Syria, which, according to the UNHCR, has created nearly 5 million registered refugees so far. Beyond Syria, many other conflicts still smolder, pushing millions of people out of countries ranging from Somalia, Nigeria, and the Central African Republic to South Sudan, Afghanistan, and Myanmar, as well as the Northern Triangle countries of Central America—Honduras, El Salvador, and Guatemala—in the United States’ own backyard. With this backdrop, the United Nations is hosting a Summit for Refugees and Migrants today in New York, followed tomorrow by an Obama administration-led Leaders’ Summit on Refugees. Both events seek to galvanize the world community to do more to protect refugees, with the administration’s event specifically geared toward securing commitments from nations to increase funding for and resettlement of refugees. These two summits represent the international community’s increasing recognition that more needs to be done to help this unprecedented wave of displaced people. It also illustrates the Obama administration’s leadership in pushing the world to increase support and funding for refugee resettlement. As the United States enters these two summits, it is time for the nation to redouble its own commitment to resettling refugees—from those fleeing violence in nearby nations to those thousands of miles away overseas. 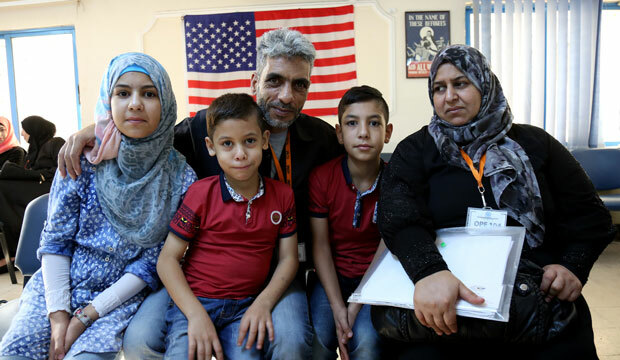 After a slow start in fiscal year 2016—in which, by the end of May, the United States had only resettled one-quarter of its stated commitment of 10,000 Syrian refugees—the administration announced on August 29 that it had hit its target. According to the administration’s report to Congress laying out its 2017 resettlement goals—the “Proposed Refugee Admissions for Fiscal Year 2017”—the administration now believes it will surpass its original goal, bringing in up to 13,000 Syrians by the end of September. Most importantly, the report to Congress makes clear that the United States will surpass even the commitment made by Secretary of State John Kerry in September 2015 to bring in 100,000 refugees in FY 2017: It raises the target for resettlement in FY 2017 to 110,000 refugees. This change—representing a roughly 29 percent increase from the FY 2016 admissions—is a welcome one and illustrates a commitment from the administration to continuously reassess and expand resettlement to match the needs of the evolving global crisis of displaced people. Nonetheless, even these numbers represent only a drop in the bucket. The UNHCR, for example, estimates that at least 10 percent of all Syrian refugees will need to be resettled, not to mention the millions of other refugees worldwide. Given the scale of the Syrian crisis, expanding the number of refugees taken into the United States is critical. But while the report to Congress calls for only a slight increase in regional arrivals from the Near East and South Asia—the region that encompasses Syrian admissions—and says that it will aim to admit a “significantly higher number” of Syrians in FY 2017 than in 2016, it does not set out a target for Syrian admissions to the United States. Human Rights First, for example, has called for the administration to admit 100,000 Syrians next year in addition to 100,000 refugees from the rest of the world. Whatever number of Syrians the administration ultimately decides to admit, it should view the commitment to resettling 110,000 total refugees in FY 2017 as a floor, rather than a ceiling, and should do everything in its power to increase the number of refugees admitted. While the full agenda and details of the administration’s leaders’ summit have not yet been made public, the material that has been released focuses primarily on the needs of resettling refugees from overseas, with no mention of asylum seekers the United States’ own backyard. U.S. Ambassador to the United Nations Samantha Power, for example, in her speech in late June introducing the Leaders’ Summit, focused primarily on Syria and parts of Africa—without mentioning the extreme violence and structural poverty pushing children and families out of the Northern Triangle of Central America. As Ambassador Power stated, “People do not become refugees by choice … they flee because their lives are at risk.” This is a situation that women and children in Honduras, El Salvador, and Guatemala know intimately. These countries are three of the most violent in the world, with particularly high rates of femicide—the killing of women and girls. Since FY 2014, nearly 157,000 children and 167,000 families have fled to the United States. Over the past few months, the number of people from the region seeking asylum in the United States has risen steadily. While the July announcement was a welcome shift toward recognizing the situation in the Northern Triangle as a true refugee crisis, as Pope’s quote underscores, the United States has not done enough in the region. Even with the new regional processing program, the report to Congress only calls for an increase in the number of resettlement slots for refugees from all of Latin America and the Caribbean from 3,000 to 5,000. This represents only a fraction of the number of people fleeing the region. As the Center for American Progress has previously argued, the situation in Honduras, El Salvador, and Guatemala can be managed in an orderly fashion, but doing so will require time and a concerted effort to tackle the root causes of violence and structural poverty in the region. In the meantime, the United States can and should do more to ensure that all asylum seekers that reach its borders are afforded full and fair due process to make their claim for protection. The nation should also build upon its regional resettlement efforts and explore ways to partner with the UNHCR and other nations in the Western Hemisphere to resettle a greater number of people from the Northern Triangle. While the Obama administration has stepped up to raise the numbers of refugees to be resettled, Congress has not, to date, provided a corresponding increase in the funds available to ensure that these individuals are able to resettle smoothly, find livelihoods, and become self-sufficient soon after arrival—a key goal of the U.S. refugee program. The funding Congress appropriated for FY 2016 was based on an estimate of only 75,000 refugees being resettled. When the administration raised its target to 85,000 refugees, Congress did not increase the funding to match. This means that over the past year, the government has had to resettle more refugees with fewer funds. To make matters worse, Congress will most likely only fund the government for the remainder of the calendar year using a continuing resolution—a stopgap, short-term funding bill rather than a full-year appropriation—likely holding the amount of funding for resettlement to FY 2016 levels. This will become all the more difficult to sustain as the number of refugees admitted grows to 110,000. Take the Office of Refugee Resettlement, or ORR, as an example. This agency helps integrate newly arrived refugees into American life and society, providing financial and medical assistance, social work and case management, and language and job training programs. It also has primary responsibility for the housing and care of unaccompanied children who arrive in the United States. In FY 2016, the ORR received a little less than $1.7 billion to accomplish these tasks. With an increase in the numbers of both refugees being resettled and unaccompanied children arriving, however, ORR’s budget is stretched thin. The administration’s FY 2017 budget, based on the original goal of resettling 100,000 refugees, calls for the ORR to receive about $2.2 billion, while Refugee Council USA—the main umbrella group for organizations working to resettle and protect refugees—has called for the ORR to receive $2.95 billion. Either way, Congress must come together to provide more funding to the agency. This week’s U.N. and administration summits should galvanize the international community to do more to protect and resettle refugees around the world. By shining a spotlight on the issue, the administration is continuing America’s long-standing position as a beacon of safety for—in the words of poet Emma Lazarus—the “huddled masses yearning to breathe free.” By expanding the U.S. commitment to Syrian refugees, increasing protecting for asylum seekers from the Northern Triangle, and fully funding the refugee program, Congress and the administration can continue to provide a much-needed leadership example for the rest of the world to follow. Philip E. Wolgin is the Managing Director for the Immigration Policy team at the Center for American Progress. The author thanks Tom Jawetz of the Center for American Progress and Jen Smyers of Church World Service for their contributions to this column.